The creator of the John Wick franchise has opened up about the future of the films with a hint to a potential fourth film. David Leitch directed the first film before handing on camera duties to Chad Stahelski for John Wick: Chapter 2 last year. Currently promoting Deadpool 2, Leitch has now spoken about what would be in store in a fourth film. ICYMI, John Wick 3 has only just began production. Again, I’m open to [returning to] the John Wick Universe and what it can offer, you know? Obviously being so close to it and creating it with Chad, in the beginning, like if it came around and it was the right time and it felt like the right story for me yeah I’d totally be up for it, of course. Dan Laustsen, the cinematographer behind the third film, took to Instagram last week to tease the second day of production. The image itself was a behind the scenes shot of Keanu Reeves standing tall with his back to the camera in the neon-lit streets of New York City. Just that photo alone is getting me hyped up for the threequel. As you can probably imagine the post, which was fittingly captioned ‘#johnwick3 #day2#chadstahelski #keanureeves #newyork #cinematography #film’, has since received its fair share of love, reports Looper. And if that wasn’t enough to get you excited as hell for the next film, then take a gander at the title – John Wick 3: Parabellum. For those of you who don’t know, parabellum is the Latin for ‘prepare for war’. But now we need to ask ourselves, who needs to prepare for war? Well if the last two films are anything to go by we’re betting it’s everyone who’s not John Wick, who’ll be more dangerous than ever, now he no longer has to play by the rules. According to Screen Rant, John Wick: Chapter 3’s plot has been kept under wraps but we can assume it will pick up right after the end of its 2017 predecessor. At the end of the last film (spoiler alert) John Wick had committed the cardinal sin by killing another assassin at The Continental Hotel, a neutral ground for assassins. His actions led to him being disavowed by the guild and a huge bounty being placed on his head. Chad Stahelski, who helmed the first two films, will be back in the director’s chair and screenwriter Derek Kolstad will be returning as well to pen the script. 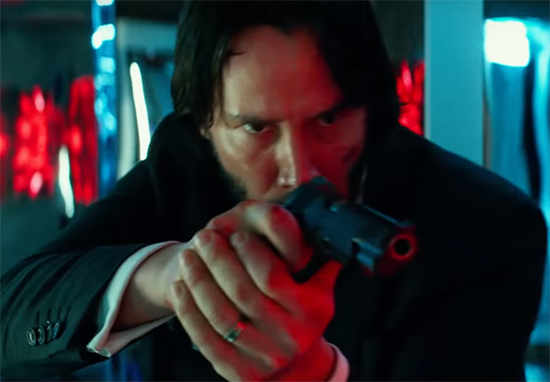 The hyper-violent John Wick: Chapter 2 was a solid box office hit for film studio Lionsgate, raking in $92 million (over £80 million) in the US. However it all pans out in the end, one thing is for sure: Keanu Reeves is going to be in a suit, possibly in a foreign country, shooting baddies like it’s NBD much to our morally-absent viewing amusement in scenes that are as close to a Matrix sequel as we’re probably going to get. Oh, and the dog too. Let’s not forget the dog.